L’orientaliste, archéologue et historien américain James Henry Breasted (1865-1935) fut nommé, en 1905, professeur d’égyptologie et d’histoire orientale à l’Université de Chicago. De 1919 à 1920, il a supervisé la première campagne archéologique entreprise par cet établissement en Égypte. Avec l’aide financière de John D. Rockefeller Jr., il créa en 1919, dans cette même université, l’Institut Oriental. “At last we stand before the silent mystery of the Sphinx. Its time-scarred, weather-beaten face looks out upon the plain, and fronts the rising sun, as it has done these many thousand years, and still we question its mute lips in vain as to its age and origin. Behind it, as if under its mysterious guardianship, rises the second pyramid, before which, on its east front, we discern the ruins of its temple, which we have already seen from the summit of the Great Pyramid. In the age when that pyramid was being built, or perhaps earlier, there arose here a promontory of rock, a jutting headland of the cliff, which one of these remote kings chose as the site and the material for his statue. For you must know that the sphinx, which is a very common form throughout Egypt, is but a symbolic portrait of the king. The lion's body, with its forepaws extending as you see beneath the cliff on which we stand, is the symbol of the king's might, and the human head is a portrait of the king. Hence, with the exception of a few sphinx-statues of the Queen Hatshepsut, the sphinx always portrays a man, and even the queen's sphinx-portraits always represent her as a man. The Greeks therefore misunderstood the character of the sphinx, in representing it as a female creature. Out of this headland of rock, then, the royal portrait was hewn, and as it now stands, it is still a part of Mother Earth. But already in remote antiquity, as far back as the 15th century B. C., the wind-swept sands of the desert had driven in and covered it to the breast, piling up in vast drifts before it, and spreading in mighty billows which engulfed both the sphinx and the granite gateway, which is just behind us on our left. Right before us is evidence of the age when this sand inundation had already occurred. Do you see standing between the forepaws and before the breast of the monster, that large granite tablet ? That is a massive architrave taken from the granite portal, which we have just visited, for a monument of King Thutmosis IV of the 18th Dynasty. By thus promising him the kingdom, the god (as the Egyptians of the time already thought the sphinx to be) furnished the young prince with a sufficient motive. He evidently cleared the sphinx of sand, and received the kingdom in fulfillment of the promise made. Subsequent generations had the incident recorded, as the story of how he gained the throne by an oracle of the god. 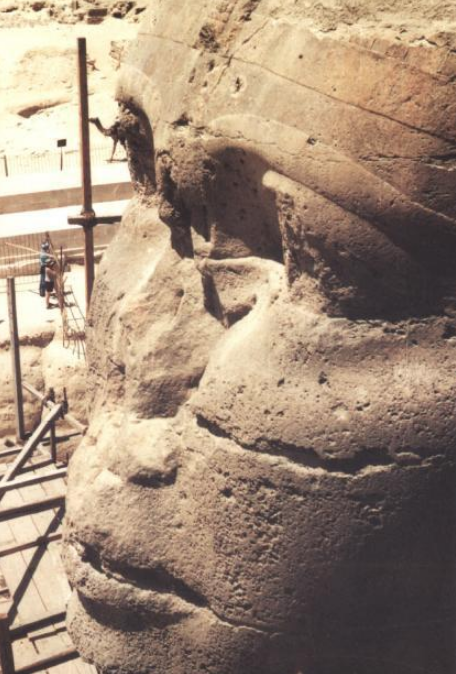 The monument was restored by Ramses II, by the Ptolemies and the Romans, but in modern times it was first excavated by Caviglia, early in the last century ; then by Mariette, and finally by Maspero in 1886. Enough has been cleared so that we may appreciate the colossal proportions of the monster. The body is said to be 140 feet long and the sacred serpent that once crowned the forehead was seventy feet from the pavement. And if a man were standing on the ear, he would not be able to reach the top of the head with upraised arm. How puny appear these futile moderns, thus contrasted so sharply with the work of their great ancestors ! For it was thirty feet from side to side of that massive royal head-dress, the face is fourteen feet wide and the mouth is seven feet and seven inches in length. What a misfortune for the Sphinx that the Moslems are forbidden images of every sort ! For what with their iconoclastic zeal, and the vandalism of the Mamlukes, who used it for a rifle target, not to say anything of the winds and storms of thousands of years, it has lost all its original comeliness. Yet up to the last century it had still preserved some of the original red flesh-color on the face; and portions of the beard were found between the forepaws ; one of these fragments is still lying there and another is in the British Museum. The face was once winning and beautiful and is so spoken of by the Arab chroniclers. The body is also excessively weathered, so that the statue of some god attached to the breast between the forepaws is quite unrecognizable. This weathering is to some extent ancient and has been repaired with masonry sheathing over the paws and sides, a work of probably Roman date. There are between the paws a chapel and an altar of late date.